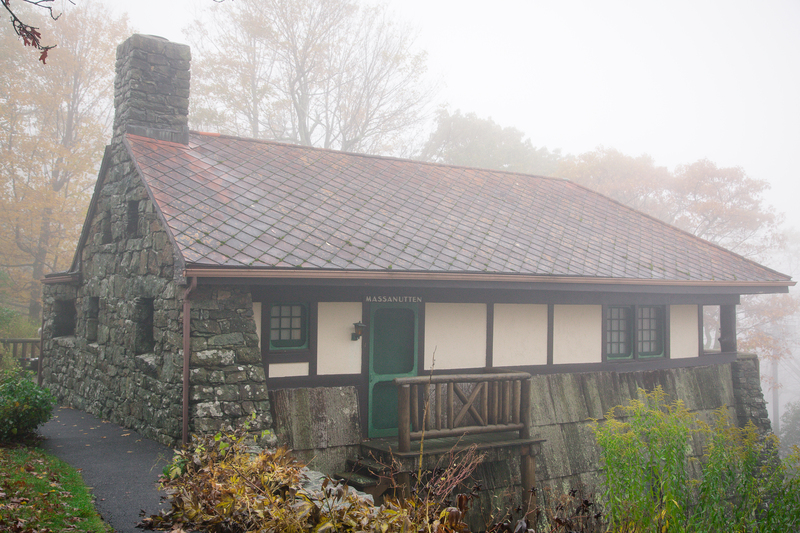 Shenandoah National Park’s humble beginnings began in the late 1800’s when George H. Pollock and his Miners Lodge Copper Company partner, Stephen M. Allen purchased 5,371 acres from the Stony Man Mining Company. Not wealthy men, they schemed and managed to sell over thirty building lots on mortgage bonds planning for resort development. 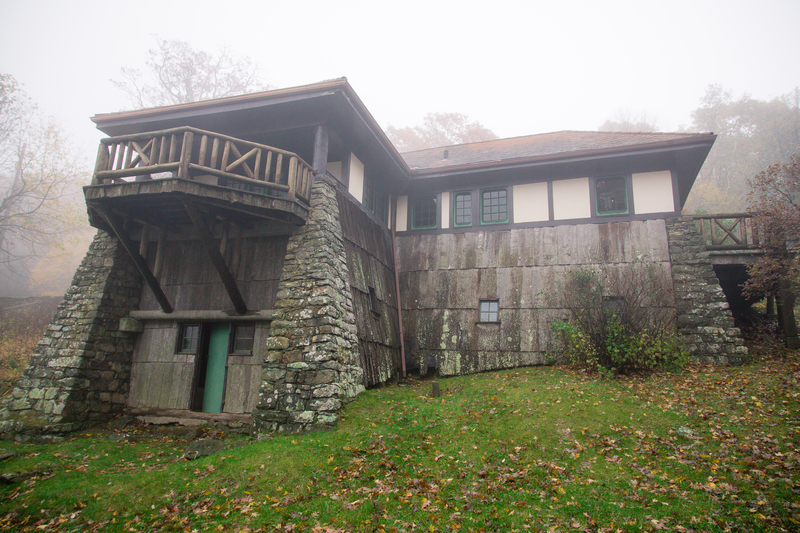 Then in 1889, the property went up on public auction and George Freeman Pollock purchased the land on credit and used his innate talent for sales and promotion to begin the footprints of Skyland Resort. But as it is in many stories, behind a powerful man is a more powerful woman. Seeing the natural beauty and wanting an elegant mountain cabin retreat, Addie Hunter Pollock contracted architect Victor Mindeleff to design the home two years prior to her marriage to Pollock. With sweeping views over the Shenandoah Valley, this charming mountain cabin offered two rooms, and even an indoor privy. Restored to its original condition, and authentic furniture set as it was when the Pollocks enjoyed the home, you step back in time of subdued elegance. The exterior is covered with tree bark for shingles. A hardy and sustainable form of finishing. Surrounding the home in the foggy afternoon were the signs of autumn. Climbing the hill to Skyland Lodge, granite boulders dot the landscape and the fallen leaves paved the way. Upon my visit, we were instructed that no photographs were allowed in the interior, but somehow this savvy wordpress blogger managed to capture the inside, so click here if you’re interested in seeing the inside. This is such an awesome cabin, and I would love to live in it. Oh..the serenity. Truly my pleasure, and I must express my envy that the other blogger got to capture the inside. She must have known someone…. I agree ! It is really awesome! Thank you so much Shedge Peth. It’s it awesome? I know you would love to spend time in Shenandoah – right up your alley. Although no caves you can personally explore like you do. What a cool lodge/house! And tree bark singles! I wondered what they were until I saw your close up, that is amazing. Interesting too how they were able to get them so flat, at least they look that way. Overall this is a bit of a bizarre place, she seems to have been an interesting woman. I’m with you – the tree bark shingles totally baffle me. How they got them, how they managed to cut them perfectly to fit on the house and how many times they need to be replaced. A true renaissance woman, with money. What more would we dream for? Oh I hope you do make it to my side of the country and visit Shenandoah, it is truly magical no matter what time of year. Seriously! I would have to turn to hubby after the first replacement and say, “So, how about we try something different?” No doubt it was labor intensive. Perhaps next year I will journey east!